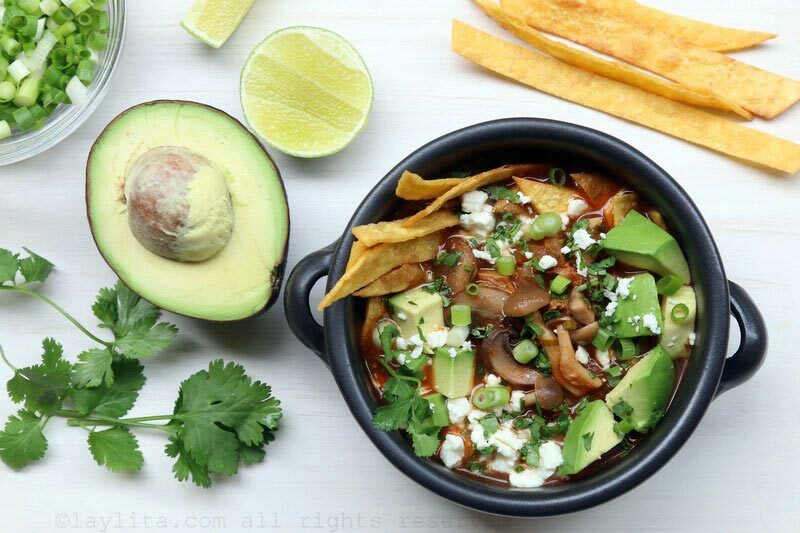 This comforting mushroom tortilla soup recipe is made with assorted mushrooms, cilantro, onions, garlic, jalapeños, tomatoes, spices, vegetable broth, and lime juice. 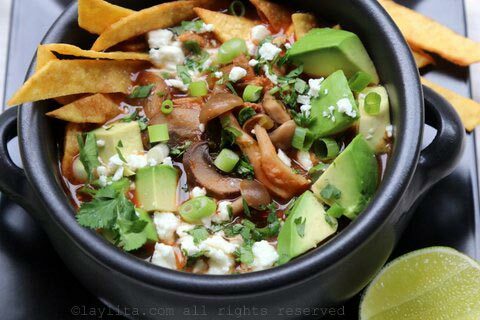 These cold rainy days are perfect soup weather; even my youngest son who isn’t a big soup fan, agrees that this is best time of year to appreciate a hot bowl of soup. 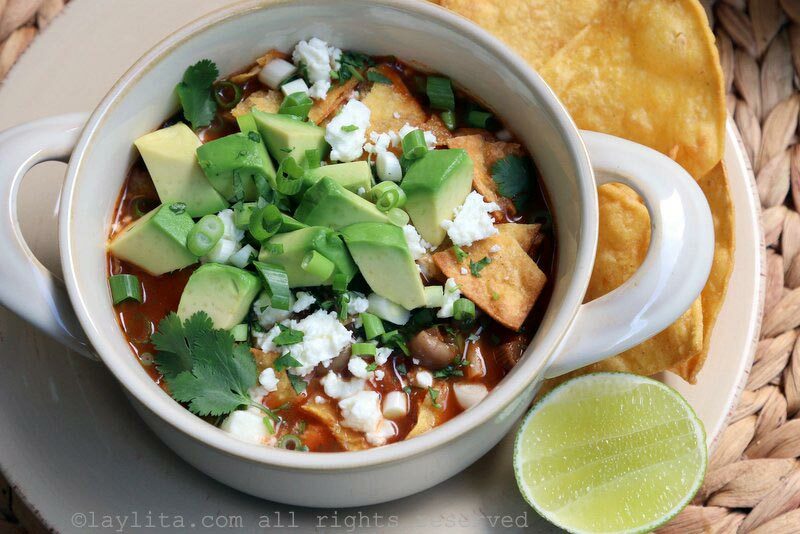 One of the things that we love about tortilla soup, besides that delicious mix of spicy flavors, is the choice of toppings or garnishes. 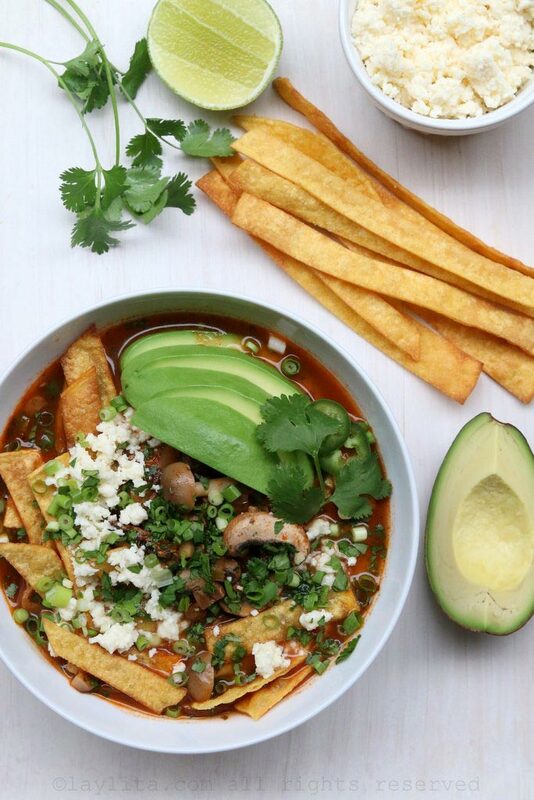 I like to serve this soup with crunchy tortilla chips, crumbled queso fresco, creamy chunks of avocado, chopped cilantro, green onions, and slices of lime. 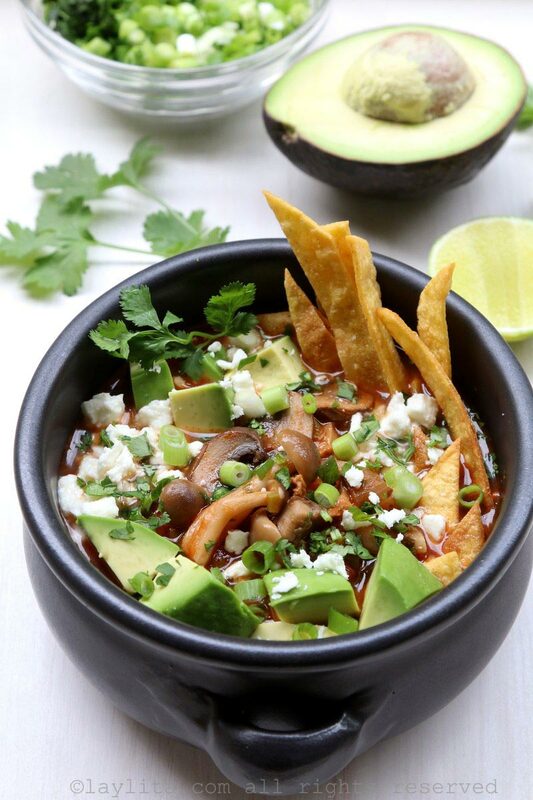 Vegetarian mushroom tortilla soup recipe made with assorted mushrooms, cilantro, onions, garlic, jalapeños, tomatoes, spices, vegetable broth, lime juice and served with queso fresco, tortilla chips, and avocado. 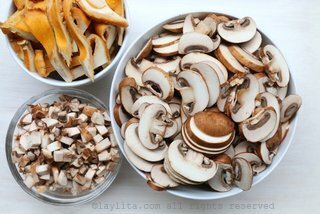 To prepare the mushrooms, you will need about in 1 cup of diced mushrooms (for the soup base) and the rest should be sliced or chopped into bite size pieces. 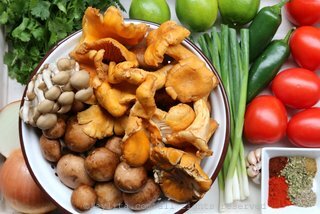 If there are any very small mushrooms you can leave them whole (if you prefer). 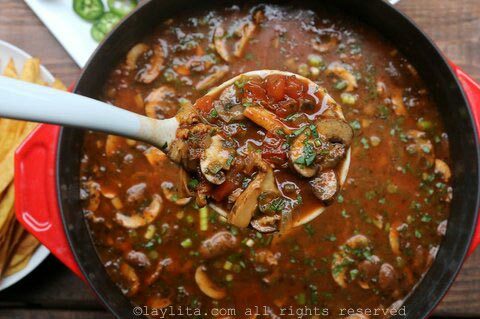 Heat the oil in large soup pot and add the diced mushrooms, let them cook until they release any liquid and then continue cooking until the liquid reduces leaving just the oil which should start to brown the mushrooms. 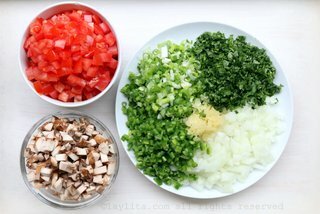 Add the diced onions, green onions, cilantro, jalapeños, crushed garlic, paprika, cayenne pepper, oregano, cumin, salt and pepper. 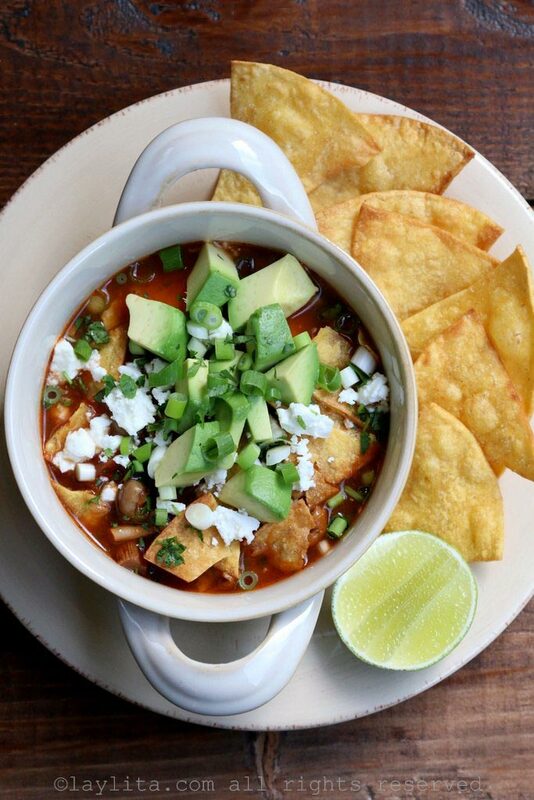 Mix well and cook on low heat for about 10 minutes or until all the ingredients are soft. 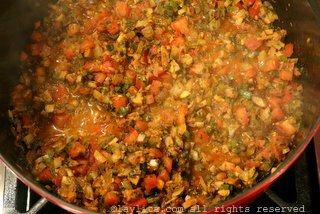 Add the vegetable stock and tomato juice. 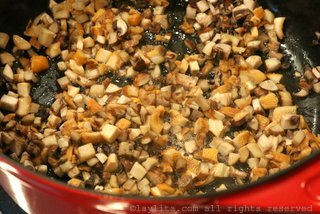 Bring to a boil, add the mushrooms and cook over low heat for about 10 to 15 minutes. 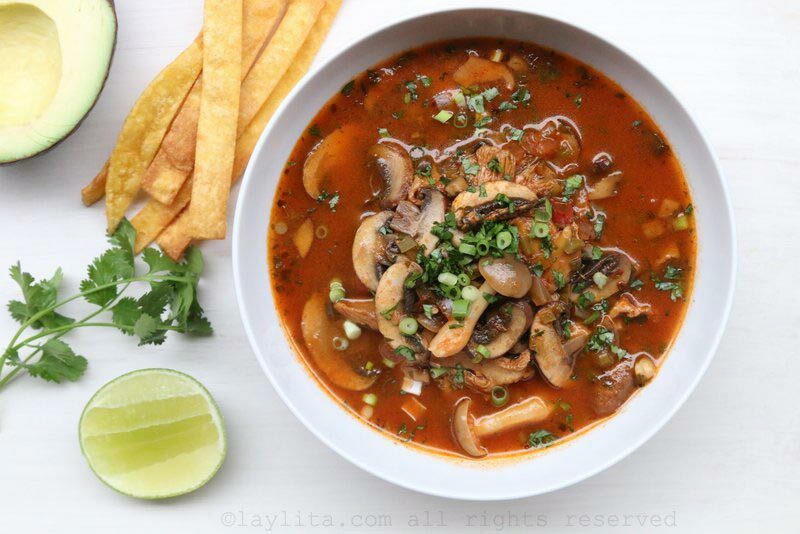 The mushrooms will reduce in size by the time the soup is done. 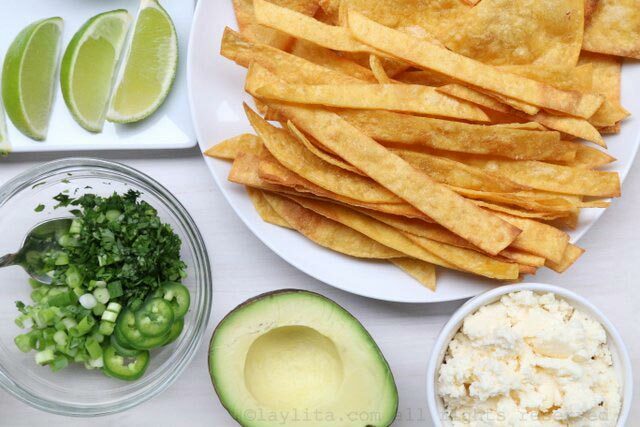 Stir in the lime juice and remove from the heat. 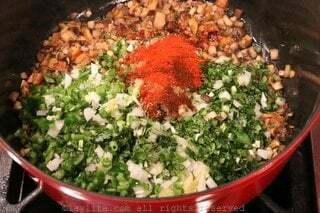 Add some of the chopped cilantro and green onions. 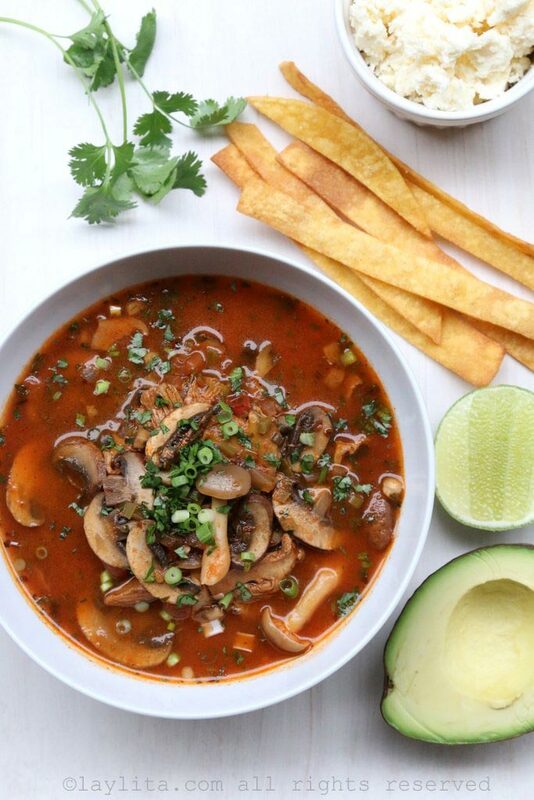 This mushroom soup is a variation of my uncle’s very popular chicken tortilla soup recipe. 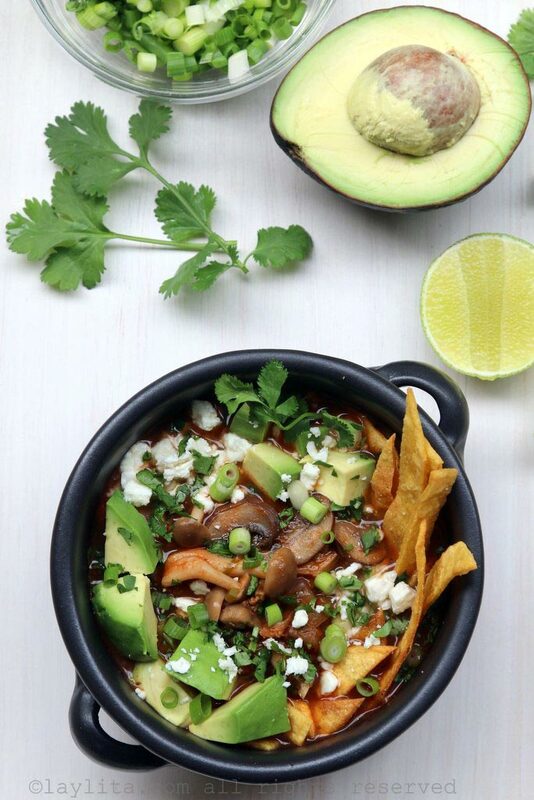 I used a mix of mushrooms for this soup, including baby portobello mushrooms, also known as cremini mushrooms, as well as chanterelle mushrooms, and some small mushrooms called bunashimeji or beech mushrooms. 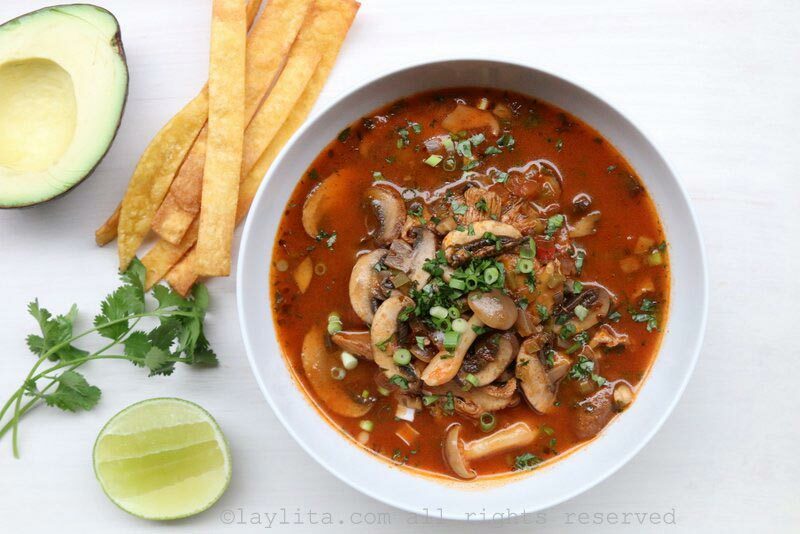 You can use any assortment that you prefer, other options that would go great in this soup would be shiitake and oyster mushrooms, and if you can’t find any of these, you can always make it using regular white button mushrooms. 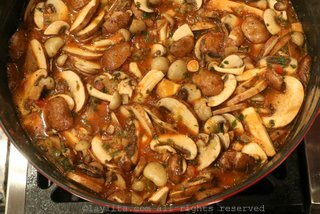 I used about 3 pounds of mushrooms for this recipe, they do reduce a lot when they cook, so if you want you can add more. 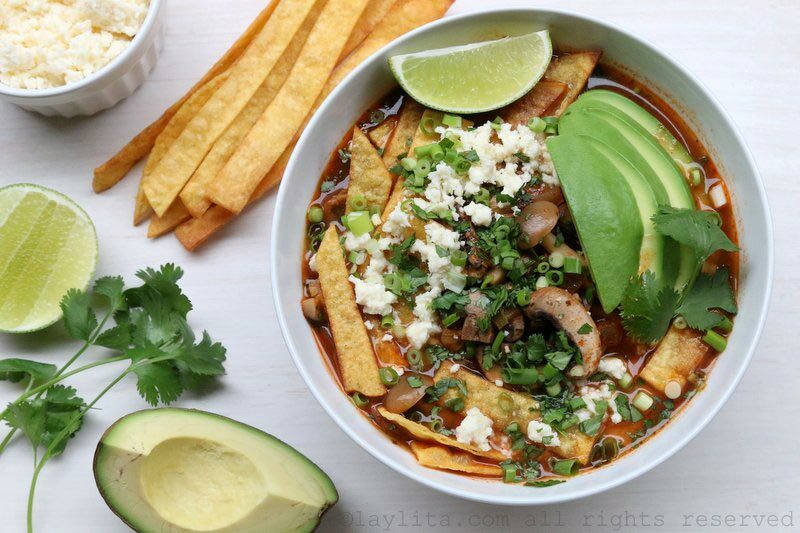 Or if on the other hand you don’t have a large quantity available, you can still get a decent amount of flavor from them, but can also add some additional vegetables or some rice or quinoa for a more filling soup.